Showcase your creativity in the latest 7-Select Artissue Design Contest! 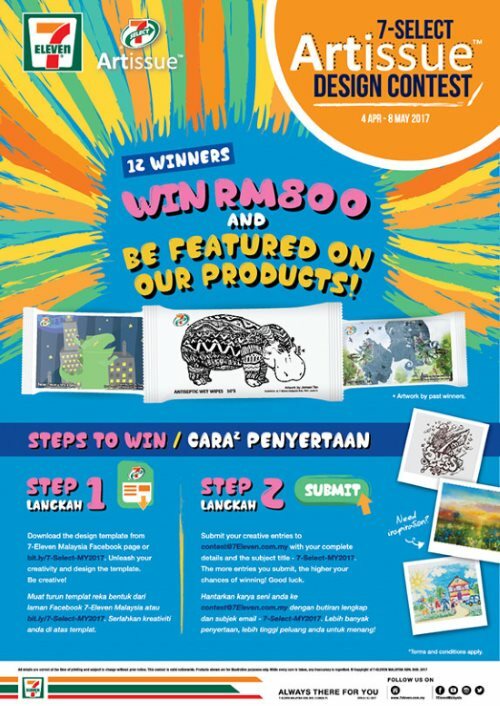 12 creative winners will be selected to win the grand prize of RM800 and have their art displayed nationwide on 7-Eleven’s in house brand tissues. Download the “7-Select Artissue Brand Design Contest” design template from 7-Eleven Malaysia’s Facebook page or bit.ly/7-Select-MY2017. You may download as many templates as you desire. Unleash your creativity and draw your design on the template. Submit your creative entries to contest@7Eleven.com.my with your complete details and the subject title - 7-Select-MY2017. Visit 7-Select Artissue Design Contest page for more details.